Indonesia has spent more than $3 billion on preparations for the Asian Games, with the government projecting that it will produce immediate and long-term benefits for the country. While investments have been made in infrastructure development and in addressing the notorious traffic issues in the capital of Jakarta, some observers say it is a missed opportunity to tackle fundamental problems and improve livability in the city of 10 million people. Ahead of the opening ceremony this weekend, roughly 15,000 athletes and officials from 45 nations in Asia and the Middle East will arrive in Jakarta and its co-host city of Palembang in South Sumatra. Following the recent bombings in the East Java city of Surabaya in May â" the worst terrorist attacks in a decade â" some 100,000 security personnel will be present. Ambient air pollution also remains a major concern, with Greenpeace Ind onesia highlighting that Jakarta has recently had the worst air quality in the world. Secutiry personnel stand guard ahead of the 18th Asian Games at Gelora Bung Karno sports complex in Jakarta, Indonesia, Aug. 17, 2018. Indonesia's National Development Planning Agency (Bappenas) projected in May that the total direct economic impact of hosting the Games will be $3.1 billion. Preparations in Jakarta and Palembang reflect the policy agenda of President Joko "Jokowi" Widodo's administration, which has prioritized improving the quality of infrastructure and transport across the vast, resource-rich archipelago of more than 13,000 islands. "Indonesia must use the Asian Ga mes and Asian Para Games to show to the world the Indonesian nation is a good host, a nation of excellence, and a nation of champions that upholds fair play," the president said in an annual speech Thursday to mark the country's independence. "We are showing that Indonesia is ready to be a leader in lifting Asia's position in the world." The Fairmont Hotel, near the main Gelora Bung Karno stadium, has seen "quite a significant increase" in the number of guests due to the Games, primarily members of the foreign delegations, said spokesperson Felicia Setiawan. Spectators ride a shuttle bus inside the Gelora Bung Karno sports complex, ahead of the 2018 Asian Games in Jakarta, Indonesi a, Aug. 17, 2018. Hosting the event demonstrates to an international audience that "traveling to Jakarta in particular and Indonesia in general is safe, infrastructure is also there. I think in the long run it will bring quite positive impacts to tourism in the country overall," Setiawan said, also noting that Jakarta remains primarily a business destination. Infamous for ailing infrastructure and heavy traffic, the government of Jakarta has implemented a multitude of new measures, including restricting certain license plate numbers from entering the city center on certain days and adjusting school hours during the two-week event. But the administration has also been the target of much criticism and mockery over "Band-Aid" solutions and bungled beautification efforts. Authorities sought to obscure the filthy Sentiong River, known as kali item (black river) and which weaves past the athlet e's village in South Jakarta, with a net, costing the city $40,500. Black-and-white concrete roadblocks were repainted in rainbow colors before authorities realized that broke the law. Indonesia has had less time to prepare for the event because Vietnam, the original host of the 2018 Games, pulled out in 2014 due to costs. Friederike Trotier, a researcher focused on sport in Indonesia at University Passau, said this has meant that Jakarta and Palembang are primarily utilizing existing venues rather than developing large new sporting facilities. "This is often more a problem for cities when they have the idea of building brand-new venues and they become white elephants," she told VOA. India's Rajapriyadharshini Rajaganapathi, right, jumps against Kazakhstan's Nadezhda Kondrakova during their women's basketball match at the 18th Asian Games in Jakarta, Indonesia, Aug. 17, 2018. According to organizers, the apartments built for the athlete villages in both Jakarta and Palembang will be used as housing for families from low socioeconomic backgrounds after the Games. The Olympic Council of Asia's honorary life vice-president, Wei Jizhong, was recently quoted in a news release as saying athletes were "very happy" with the facilities and that, "We support the government policy of benefits to the low-income people." But according to Elisa Sutanudjaja, executive director of the Rujak Center for Urban Studies, the preparations have been a "wasted opportunity" for Jakarta to become a better city . 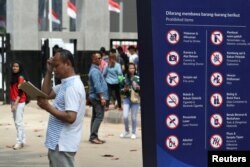 A man stands next to a sign showing prohibited items at a gate of the Gelora Bung Karno sports complex, ahead of the 2018 Asian Games in Jakarta, Indonesia, Aug. 17, 2018. "They only tried to fulfill the minimum requirements which is dealing with basic things like venues and the athlete village, the accommodation, but not necessarily on making the city better," she said. "We don't see any drastic change, unlike any other host cities in the past like London or Sydney or Vancouver," Sutanudjaja added. "Even when you compare with the past Winter Olympics in South Korea, I think they're doing much better than us." In any case, Indonesia's government is hoping it will boost the nation's international profile. "The Asian Games have a really important history for the continent," Trotier said. "To have such an event could mean a great chance for Indonesia to be more visible in the Asian context. "For a Southeast Asian country to host this event could actually mean to diverge this focus on East Asia â¦ and for other regions to say, 'Asia is more than just China, Japan and Korea.'"